This program is to be broadcast in Australia on Sunday night. I understand it will include highlights of a panel discussion during the conference I attended in Sydney in June. The Dalai Lama’s characteristic wisdom, humour and humility shone trough (how many people are so willing to say ‘I don’t know’?). In terms of the other panelists, I thought the star was Madga Szubanski — she was warm, intelligent and insightful. “Everyone wants to be happy, but why is it a state of being that is so hard to obtain? There is little understanding of what actually leads to happiness, and in tonight’s special episode of Compass, we explore the latest thinking on how it can be achieved. Compass host Geraldine Doogue heads a panel discussion during His Holiness the Dalai Lama’s recent visit to Australia for the 2nd Annual Happiness And Its Causes Conference at Sydney’s Darling Harbour. 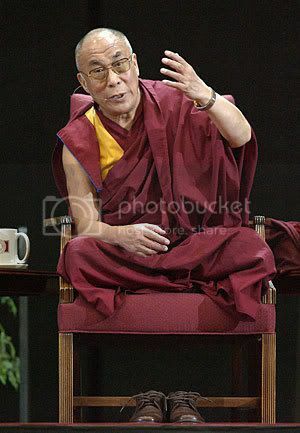 As one of the world’s most notable and sought-after religious leaders, and winner of the 1989 Nobel Peace Prize, the Dalai Lama has spent years preaching the path to peace and happiness, attracting thousands of people from different denominations all over the world. Positive psychology – Coming to a theatre near you?